Stephan has worked for many years in a variety of audio related roles for many different projects and groups. 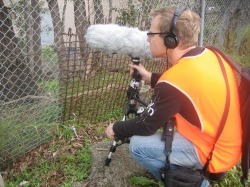 Sound recording, Foley, sound design and implementation as well as composing producing and editing music are all regular aspects of his professional life. If you have a project that requires audio production on either a large or small scale please contact us to discuss your requirements. Stephan stands by the quality of his work and his passion for what he does. Stephan has spoken at conferences around the globe and provided training for some of the most highly regarded institutions and studios on a range of audio related subjects..
Stephan is happy to be approached for speaking and lecturing appointments. Fees, where applicable, will depend on the nature and length of the presentation. Speaking appearances at government run schools will usually only incur transport costs at most. Stephan is very keen to help encourage the next generation of audio creators.